La Boca, Argentina - Miss it or Must-See? “We are locking the doors because there are a lot of carjackings in this area,” explained our tour guide on the way to La Boca. “This is a very poor neighbourhood, but we should be ok because we are in a private car,” she elaborated and begins to tell us the history of the area. Some brand parts of this historic neighbourhood of Buenos Aires inauthentic and unrepresentative, but knowing the history of the suburb synonymous with tango and football can make all the difference to how you view La Boca, Argentina. In the late 19th and early 20th century, Buenos Aires saw an influx of foreign immigrants. A sizable portion of these were from Italy, in particular, the port town of Genoa. The new residents settled in working-class neighbourhoods like La Boca “the mouth,” referring to the mouth of the adjacent river. Here they were close to the shipyards where they could find work. The growing population of the city meant there was a housing deficiency, so the new arrivals had to construct their own dwellings. Conventillos-shared houses-were built of scrap materials from shipbuilding. These longhouses were divided into small individual rooms that shared a communal patio. The Genoese are also attributed with bringing the idea of painting their houses in bright colours from their homeland, using paint left over from the shipyards. The suburb remains working class today, although the industries on the riverside have moved far beyond shipbuilding, and the housing has faded to derelict grey. It is obvious to me peering out the car window that we are in little more than a shanty town. La Boca sits on the banks of the Riachuelo river, a waterway that is so polluted it was listed in the Blacksmith Institutes’ “Dirty Thirty”- a roll of the world’s most polluted places compiled in 2007. Although I couldn’t find a reference for the claim, our guide told us that the water is so polluted it is no longer classified as water, but as a toxic substance. 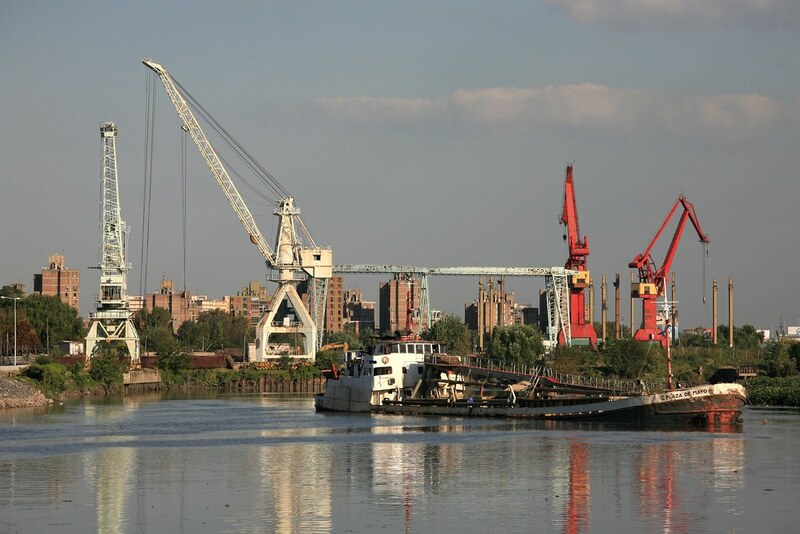 The Riachuelo has been a dumping ground for the city since the 1600s, with various industries building factories on its banks and releasing waste directly into the waterway. The polluted flow gives off a putrid odour and is blamed for many illnesses amongst the population that live by its side. Though the river is toxic and the housing situation no better than one hundred years before, there are two subjects of enormous local pride – tango and football (soccer). Both have local shrines, Caminito and La Bombonera, which are drawcards for tourists in this otherwise undesirable neighbourhood. “Stay only in this street, this area is dangerous” cautioned our guide as we were dropped at one end of Caminito, “and wear your backpack on your front, there are lots of thieves.” Caminito, “little walkway,” was an abandoned rubbish dump before local, Benito Quinquela Martín a very successful painter, watched as the early 20th century took its toll on the vivid patchwork of corrugated conventillos he knew as home. In the late 1950s Quinquela Martin began to transform Caminito into an exhibit of La Boca’s history, through restoring and painting the buildings lining the street in a way that was representative of the La Boca he grew up in. The street remained an uninhabited example of the “original” La Boca, an outdoor history museum and gallery where artists show and sell their work. So where is the Caminito connection with Tango you ask? 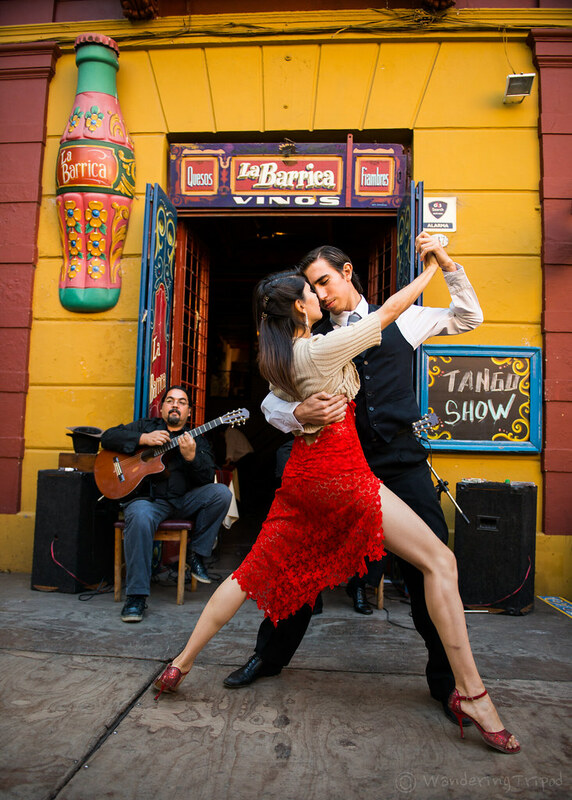 Tango originated in Buenos Aires in the late 19th century and is said to have emerged from the cultural crossroads of the lower class immigrants congregated in the conventillos of La Boca sharing their respective cultural and musical influences. Benito Quinquela Martin was close friends of musician and La Boca local Juan de Dios Filiberto who wrote a well-known tango in 1926 by the name of Caminito. 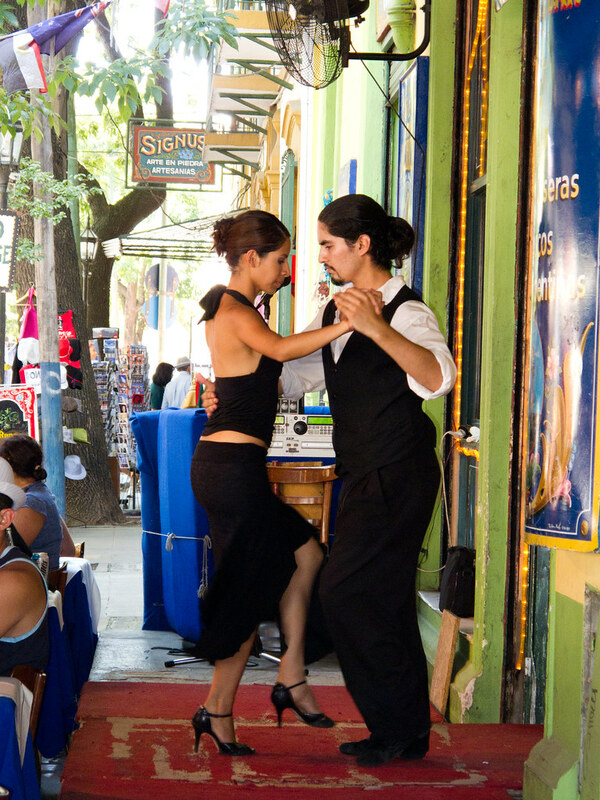 Quinquela Martin named the street in his friend’s honour, and Caminito has become a centre for showcasing tango in its birthplace ever since. La Boca is also the home of Boca Juniors, the formidable football (soccer) team whose fierce rivalry with River Plate, an opposing team founded close to the La Boca district, is known by football fanatics worldwide. Boca Juniors lay claim to arguably history’s best footballer-Maradona. Their home ground nicknamed La Bombonera, meaning “chocolate box,” is officially called Estadio Alberto J. Armando. The 49,000 capacity stadium replaced the original wooden stadium the Boca Juniors had played in since 1924. The newer concrete structure opened in 1940 and was gradually added to over the following decades. La Bombonera is an architecturally unusual arena due to space restrictions that meant it was constructed with one flat side. The shape reminded the chief engineer of a box of chocolates, “bombones” in Spanish, he had received from co-workers. Hence the stadium was christened with its popular nickname. La Bombonera hosts a number of sports and concerts, all of which are clearly second to football and the Boca Juniors in the eyes of their passionate fan base. 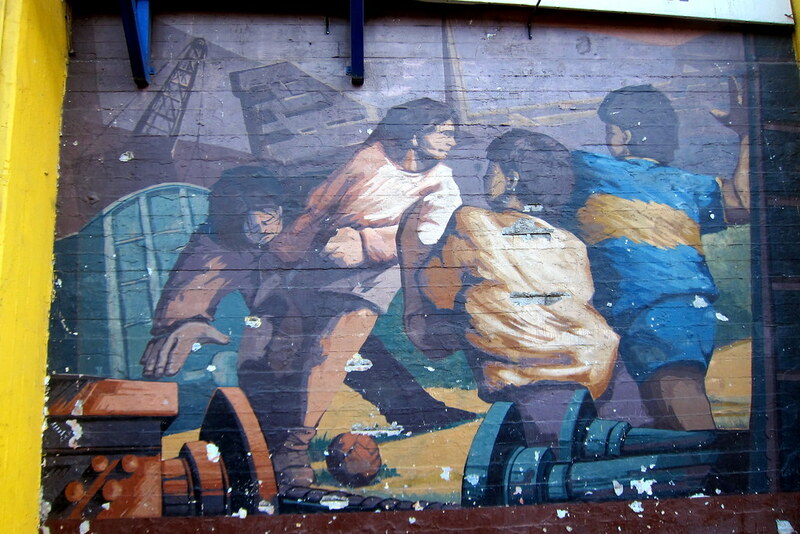 The hallowed walls feature murals by artist Pérez Celis celebrating Boca Juniors most revered players, and depicting La Boca’s immigrant-driven history. With a little historical knowledge under your belt, you can see why La Boca, Buenos Aires is such an interesting place for visitors and a point of local pride. Some claim Caminito is inauthentic, but it is illustrative of La Boca past and the safest place for a foreigner to enjoy the neighbourhood besides an organised tour of La Bombonera. Some say Caminito is unrepresentative of the rest of Buenos Aires. Of course it is! La Boca has always had its own history and personality, separate from that of the faux French palaces of uptown. Even the Riachuelo has its own story, sludgy, smelly and sad as it is. If you want to experience all facets of Buenos Aires, La Boca is an essential inclusion on your itinerary. Just get yourself a knowledgeable guide, dress down and don’t carry unnecessary valuables. If you want to do a little aural study beforehand – here is my Spotify playlist of tango tunes to get you started.